Google SERP (search engine results page) is full of handy features and enriched organic results nowadays – the so called rich snippets. In this guide I will show you what types of rich results and features you can find in Google SERP in 2019 and how you can implement them and benefit from them as a website owner. Rich snippets are enhanced search results displayed by search engines on their results page. In opposite to a common organic results they have more visual appeal. They are described by structured data implemented by webmasters on their websites. Although there are hundreds of different rich snippets and organic link enhancements, many of them are very similar, very specific or have almost no impact for you. That’s why I have picked 28 most significant rich snippets and SERP features and structured them into 6 categories mentioned above. I have also prepared a big rich snippets infographic to showcase all the possible SERP features and rich snippets at once. You can click on the feature and read more about it below. Feel free to share! We are not affiliated in any way with any of the included companies. Adwords ads are an inseparable part of Google SERP since they appeared for the first time in 2000. They appear above and below the organic results. In the past, they used to appear also on the right side of the desktop SERP. Nowadays, you can play with a lot of catchy and useful ad features such as telephone number, directions, sitelinks, reviews and many others to get even more powerful ad that generates higher CTRs. With the right setup of Adwords ad you can achieve a nice CTRs and related traffic. They are suitable for every business – e-commerce, SaaS, local business etc. As opposed to organic results that can bring a continuous traffic without extra cost, in PPC ads you pay for every click. The only way to get them is to set up a sponsored ad in Google Adwords. You should know something about pay per click ads, PPC competitors, right strategies, etc. Also known as Product ads or Product listing ads. They appear above the organic results, which is super prominent and eye-catching spot. Every product may contain an image, price and rating. When user clicks on a product he/she is redirected to an e-commerce site or to a Google Shop. You will find everything you need on the official Google for retail page. This is a great solution for retail. You can feature your products in catchy ads with solid ROI (542% according to this case study). You need to have a Google Adwords account and to set up a Google Merchant center and link them together. Then you should follow their guide. It’s basically a flight finder embedded right in the SERP. It’s a great feature from the user’s point of view, however, some website owners may be not very happy about it. 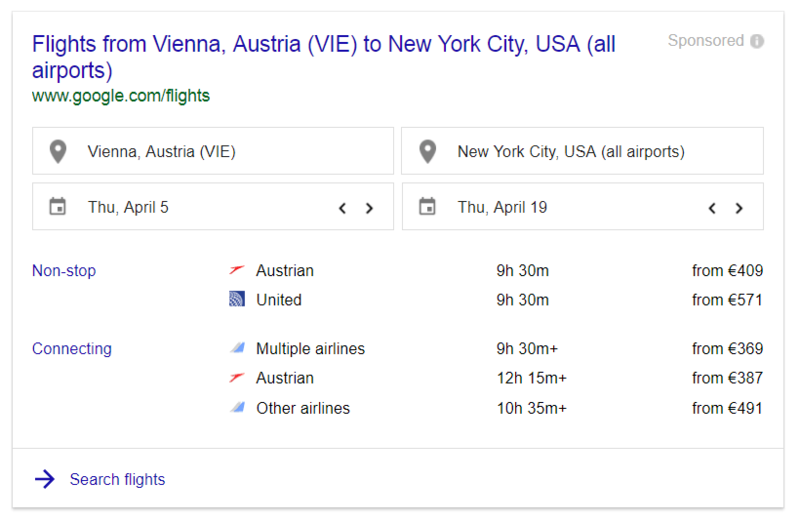 This feature is not very popular among portals with cheap flight tickets, because it can be shown for queries like “cheap flights to nyc” and push the organic results down the SERP, which leads to a significantly lower CTR. 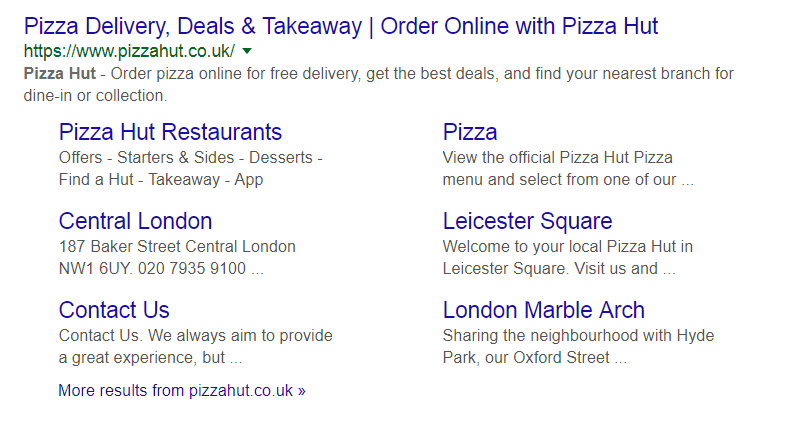 Google probably simply crawls airline websites and shows their offers in the SERP. Some of the flight offers may be sponsored by an airline. Similar to any other knowledge graph, it usually appears on the right side of the SERP (desktop). It appears for brand queries. Contrary to the general knowledge graph, local business panel contains information from Google My business page. All types of businesses, especially local businesses like restaurants, hotels, etc. When potential customers search for your business in Google, they will find a lot of useful information right in the knowledge graph. Although they may not visit your website, they can do other direct actions, e.g. call you or find a way to your store, which is probably your goal. In other words: a prospect will get an “instant answer” to his/her problem and is happy = great UX. Moreover, you will get a conversion or at least a lead. Win win. If you are a dentist, hairdresser or owner of any type of local business (hostel, restaurant, etc. ), it is a must to have a Google My business page. You can include a lot of information and set up features about your business that will allow you to appear in many different kinds of Google SERP features. In other words, local businesses displayed on the map. A map pack usually appears on the top of the results, however, it can be found “in the feed” too. It may also include a special actions – book a hotel, find the best restaurant by rating, etc. and options to filter and sort. Your business is featured based on the location. This brings a super relevant traffic, or even direct calls or bookings. And that’s what you want. Again, Google My business page is a must! Only if you have it, your business can be featured in a Map pack. 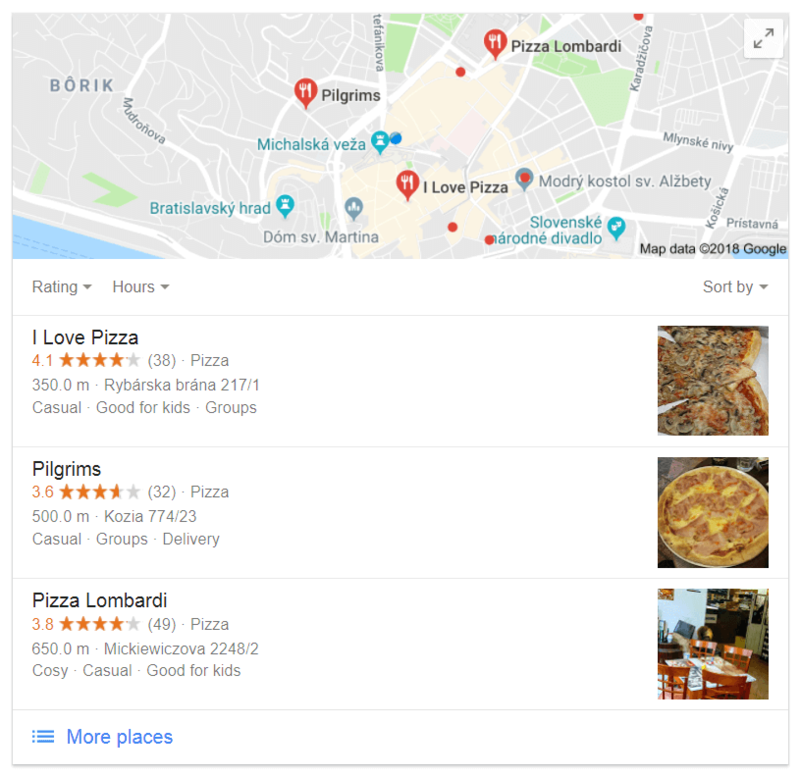 The location must be relevant – Google displays only local business related to the user’s current location (or intended location). Good user reviews and place popularity will help. Currently (March 2018), the top places list is a BETA feature. It is a non-sponsored list curated by any content provider and must be independent. Local businesses like restaurants, hotels, etc. If you appear in such a list, it’s a real honor as these lists are made by real people, the reviewers. It makes your business look like a real trend and a trusted quality business. Another reason to have a Google business page. Once you have it, you must wait until you are featured. Also, you can become a list publisher. You will find more information here. This feature appears for the search queries like “pizza near me”. It is a list based on Google places attributes that group similar local businesses. It features lists like “Pizza delivery”, “Local food”, “Cozy restaurants”, etc. When you click on it, it will open a Google Maps app with the list in the left part of the screen and the featured businesses on the map. Another place where you can benefit from your Google business page, but not so common. Google My business page is necessary for this feature too. It cannot be influenced directly, as it is based on Google algorithm. You can appear in such a list if your business is popular and people leave a place description in the business page. It appears for search queries that are looking for a quick answer like: “How many calories has pizza”, “Weather in sydney”, “Mexico population”, etc. There are many different types of answer boxes, such as: “weather widget”, “exchange rate”, “top sights” or even “earthquakes information”. All of them have one thing in common – they answer the user’s question directly, so it is not necessary to click on any organic result. This can lead to almost a zero click to the results. It has a big value for the user, but no benefit for the website owner. It provides an instant answer of the search query, so the user usually leaves SERP without clicking on any organic result. That means lower CTR for the organic results, so it’s not beneficial for most of the website owners. 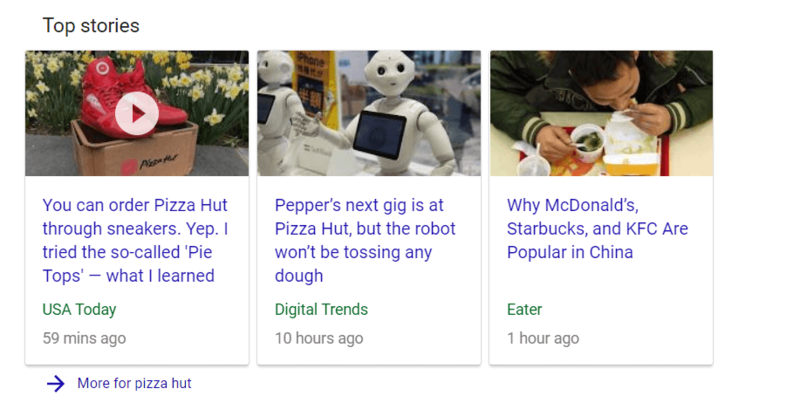 Google uses data from authoritative websites to be featured in this type of snippet, so unless you are an authoritative website such as Wikipedia, your information probably won’t appear in the answer box. Knowledge graph offers a detailed information about entities like companies, famous persons, books, movies, songs, places, etc. This information is retrieved from different authoritative sources such as CIA World Factbook, Wikidata, or Wikipedia (source: Wikipedia). It may contain a lot of other SERP features like similar entities, relations between other entities, upcoming movies, other famous songs by the artist, events, social profiles, ratings, video carousels etc. It usually appears in the right panel on the desktop, however, it can be found also at the top of the main feed. On mobile devices they are usually at the top. It has no direct benefit for your SEO. On the other hand, there are some indirect benefits like gaining trust of the users, as the information in the knowledge graph is always from an authoritative source. If the user will find an answer in the knowledge graph, he/she probably won’t click to any results. There is a structured data markup available, however, Google can ignore this markup if the website has low authority. You should try to get a wikipedia page as it is an authoritative source of information. The other way is to get a Local business page on Google which is slightly different. Also known as a “Position zero”. As with an Answer box, a Featured snippet gives a direct answer to the user’s search query. Featured snippet includes an instant answer snippet based on website content with the link to the website. It appears above the organic search results in the SERP for the question queries like “How to write a check”. Its occurrence is between 9.2 % – 12.3 % queries. It can be a paragraph (the most common, ~80% of featured snippets), list or table (the least common) and it can include an image. Most often, it appears for factual or question queries such as “how to…”, “how do…”, “what is…”. 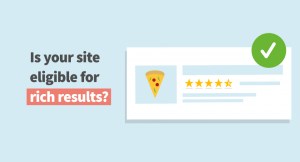 You can find a really nice case study about featured snippets at Ahrefs blog. All types of businesses, blogs, factographic websites. Featured snippet appears above the organic results, so it is natural that this prominent place catches the user’s attention. Featured snippet usually comes from position 1-7 of the first SERP. That means that even though your website ranks at position 7 in the organic results, it can appear as a featured snippet, “steal” the first position and get a super-relevant traffic. It just has to give an answer to a particular user’s query. If you are in a SERP with a “featured snippet” and you don’t appear in it, it can lead to lower CTRs. Write content that answers the questions that people have. There is no special structured data markup to get a featured snippet, however, having one can improve your chances. Your content should be structured as a heading with a paragraph that clearly answers the question in 3-5 lines. Or it can be a heading with a table, or a list with steps. You can look for “People also ask…” and try to answer a related question. I recommend to have a look at our case study how we won featured snippet for 2 blog posts. One image says more than thousand words. Image pack is a common feature in the SERP. Google usually displays images that describe the query, especially for fact queries (“USA”, “rainbow”) or product queries like “yellow socks”, etc. It may appear anywhere in the organic results. All types of businesses, especially e-commerce websites or factographical websites. The user can land on your website by clicking on the image link. However, the CTR is usually low in these cases. In other words, having an image from your website in an image pack is not very beneficial. You can appear in the SERP with your youtube video or a video hosted on your site. The result will appear as a thumbnail next to the organic results, or as a prominent video knowledge graph or panel. If you have resources to make your own videos, do it. I recommend to check out some useful video marketing tips. Besides the common video thumbnail and video knowledge panel, videos may also appear in a carousel, both on the mobile and the desktop devices. It is always a good idea to have a video on your website. It increases the user engagement and grabs the attention. If you appear in a SERP with your own video thumbnail, it increases the CTRs, and the user will likely stay longer on your site. Uploading and managing a video on a youtube channel is a chapter on its own. With a good marketing strategy, it can also bring interesting traffic to your website. If you decide to host (or embed) a video on your own website, you have to include proper structured data markup. Please, refer to Google guidelines. 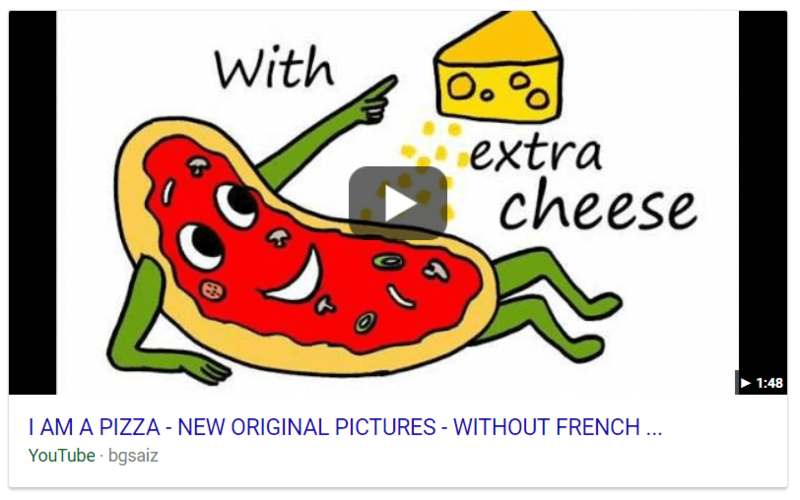 In general, it’s easier to appear as a video thumbnail in SERP with youtube video. You know them as a list of articles displayed in a carousel (top one) or as a “pack” of rows result (bottom one). Most often, they appear for search queries like “USA” or “Donald Trump”, that bring search results for current society topics. Especially news portals, professional blogs, up-to-date content. It is really prominent as it is displayed as a standalone card with an image, title and date so it can bring some extra clicks from the SERP. The last one is not necessary, but it will ensure that your content complies with Google guidelines, as there is a quality validation process. Google News will also bring you to the News feed in Google. Read more about how to get there on Google support center. In-depth articles contain high-quality expert content that can help the users to deepen their knowledge. Factographical websites with expert, long and high-quality content. Besides a slightly higher CTRs, it may bring higher brand visibility as well as a certain amount of trustworthiness for your brand. It is based on internal Google algorithm. Your website has to be authoritative and contain high quality content. It doesn’t matter if you are a big news portal or you have a personal blog. If there is a long, high quality content, Google may include your website. See this statement by Google. 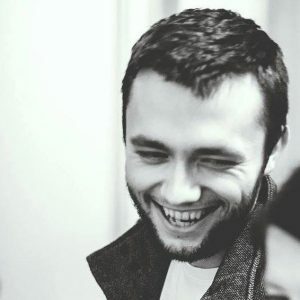 If you want to appear as an in-depth article, you should write long, high quality and unique content marked up with a structured data markup for article (don’t forget to include your company logo within the schema markup). Sometimes, a twitter account with the latest tweets may appear in a SERP. This is mainly for queries about fresh news, e.g. for “president elections”. And we all know that Twitter is usually the first place full of hottest news and opinions. Try to google “Donald Trump” for example, and you should see his latest tweets. I guess this feature is country sensitive. I haven’t been able to simulate it in Slovakia, however for USA users it is quite common. News portals, general companies, personal brand. It is a nice way how to promote your Twitter account and your brand, especially if you own a news portal. My assumption is that you have to have a verified Twitter account and tweet about actual society problems. Or if you are a big famous entity like Elon Musk, people are always curious about your life or thoughts. If you a have a mobile application that contains your content (e.g. you have a reader for your news portal), you can benefit from the so called App indexing. Let’s say you have a news portal. You can link this content to be opened in the app right from the mobile SERP. If the app is not present in the system, user will be redirected to the Google Play store (or App store). I referr to the image on the right side. If a user searches for a general app like “weather app”, the special colorful app grid will be displayed, including results for Google Play / App store applications. After clicking on one of them, he/she will be redirected to the store or to the app. Businesses with mobile application strategy, like news portals, stream services etc. I see benefits in higher CTRs – the result will be displayed with the app icon, which makes it more eye-catching. If the content is displayed in your own app, you can provide a better experience. 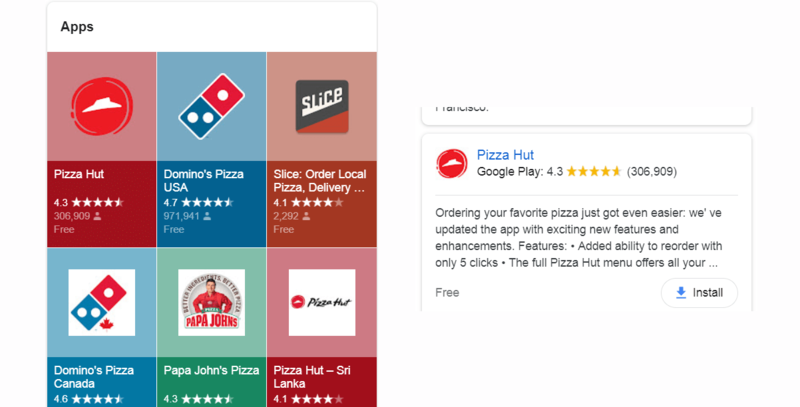 If the user doesn’t have your app installed, it may lead to more app installs. If the user has already your app installed, you can communicate with him/her via native notifications which results to higher engagement. Quite a new SERP feature announced in the second half of 2017. It appears when a user is searching for phrases like “jobs near me”, or “seo jobs”. 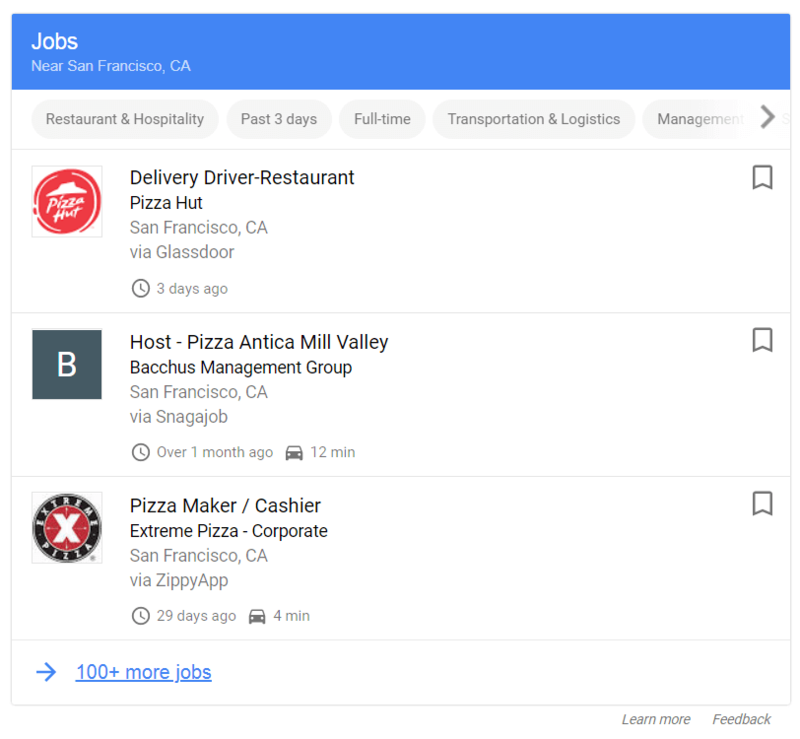 The content is displayed as a “three-pack” generated from the structured data markup from the websites that offer jobs. All types of businesses searching for new employees. The only benefit of this SERP feature is the promotion of your job posting. The user will find your job posting really fast – right in the SERP. As mentioned above, proper structured data markup is needed. See Google Developers guide. Star ratings usually appear within the products, reviews or recipes. It makes the result really eye-catching as a little orange stars contrast with the rest of the SERP. E-commerce solutions, reviews, recipes, products and services. High CTRs. Orange stars really grab your attention in a white ocean of Google SERP. According to this case study, they may lead to up to 35 % higher CTR. "name": "KWFinder - keyword research tool"
if possible, it’s good to include possibility to add reviews for users directly on a page. Price is one of many enhancements of an organic result – it can be price of a product, course, software, service… you name it. You can also include an image and a lot of additional information like availability of stock, software application category, number of calories for meals, author of a book, date of publishing and many many others. You can find inspiration on schema.org page. E-commerce websites, products and services. 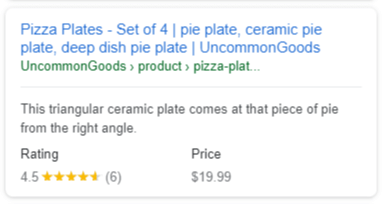 Displaying price within your organic result can be counterproductive, but image, stock info or star rating make your organic result more eye-catching, which may lead to higher CTRs. Organic results may contain information about upcoming events, e.g. a band can markup their shows there. It is also possible that Google will display it in the Knowledge graph. Music bands, shows, festivals, courses, etc. Higher CTRs. It’s kinda catchy as numbers will always attract people attention. An image can make the feature even more prominent. Good old friend: structured data. Please, refer to the Google guidelines. You know them from the website navigation. In the SERP, they replace the classic URL of a result. It’s a simplified and a common version of URL of the result. Categories and leaf pages are separated with chevrons. On the desktop you can achieve it with the right structured data, in mobile SERP it is automatic for all results. All types of businesses, especially if your website has a rich structure. 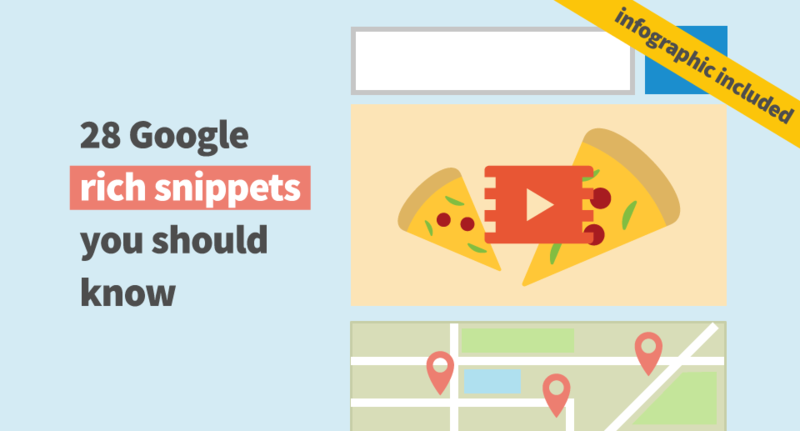 Breadcrumbs (as opposed to a common URL) are easier to read for people, so it leads to a better UX right from the very first interaction with your website in the SERP, which can also lead to a higher CTR. It’s really easy to implement it on every blog or ecommerce site – just another structured data to your website. If you have a WordPress site, you can do that with SEO plugins like Yoast SEO. You know them as a “six-pack” in the SERP. It’s a super prominent feature that appears mainly for branded queries. Sitelinks contain links to leaf pages of a current website with title and description. It may contain 2 – 10 sitelinks. Appearance on a mobile is a bit different from a desktop. You may also spot small sitelinks as a vertical enhancement of an organic result. It mainly appears for the root domain, but it can be shown for a leaf page too (e.g. if you have the blog as a leaf page, blog categories (leaf pages) may appear as sitelinks). All types of businesses, especially if your core organic traffic comes from branded phrases. You can’t directly control the occurrence of sitelinks. Only Google decides whether to display them or not. However, the best practise is to have a clear website hierarchy in a top menu website with descriptive anchor text. The sitelinks are links from the menu. A prominent feature that appears within the sitelinks. It allows a user to search within the results from the current website. The results will appear right in the SERP, as a search with “site:” parameter. However, a website with high search volume for branded keywords can be eligible for search box that drives users directly to the website search. I don’t think people really use this search box. However, it makes the organic result more prominent which can lead to higher CTRs. You can also get a search box that will drive users right to your page search results. When searching with sitelinks search box, user will spend more time in the SERP. The big companies like Amazon may not be interested in that Google see searches users made on their sites. There is an interesting discussion bellow this article on MOZ. The search box can be implemented with a schema markup. Below is an example of a search box on our blog. The following features are not something where you can appear or influence them. The are all features that makes research easier and better for a user. In following features there is not benefit for your website, however it can negatively influence CTRs of the organic results. Carousel is a really prominent SERP feature. It appears above the organic results, right below the search bar. It usually displays a list of similar or related entities. It usually contains images with titles that link to the new queries. You can find them for queries like “London monuments”, “banana songs”, “Ozzy Osbourne children”. There are no benefits for webmasters as they contain only links to new search queries, there is no link to a website. It doesn’t include links to websites so you cannot appear here. It works like a specification of a query. E.g. if you search for “To kill a mockingbird” there are results for “to kill a mockingbird” book. However, below the knowledge panel you can find this “Specify query” box which redirects you to a query “To kill a mockingbird” movie. It appears as a white box on the right side (on desktop) or directly in the feed (on mobile). It’s a handy feature for the user but there is no significant benefit for a website owner. It fires a new query so there is no potential for webmasters. You can find them below the organic results in almost every SERP. If you click on one of them a new search query is made. They are based on the previous search queries of the users. Related searches are a good source of long tail keywords for your website, because they show the intent of people searching for similar queries. This feature appears in the SERP for the question queries like “How to write a check”. Its occurrence is a little bit lower than Featured snippet (20% vs. 24% according to this case study), but often, it coexists with Featured snippet (66 % of featured snippet SERPs). If you click on one of the questions, a featured snippet with an instant answer and link to a particular website expands. “People also ask” snippet can also generate some traffic for your website, however, usually not so much as with the featured snippet. 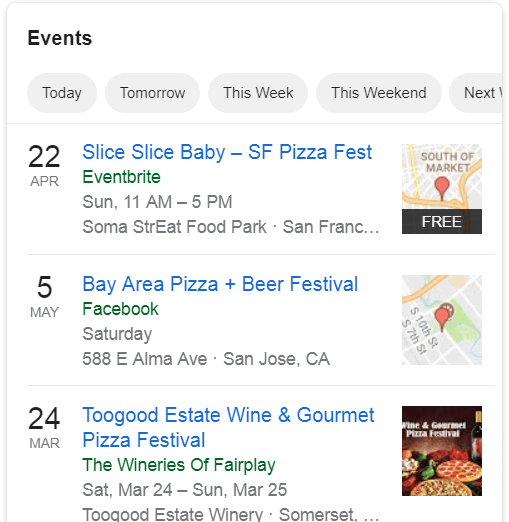 Similar entities feature usually appears as a part of knowledge graph, however, it may also appear as a standalone SERP feature below or above the organic results. It runs a new search query with an associated term. It’s a handy feature for the users to find exactly what they are looking for. It fires a new query so there is no potential for webmasters. So that’s all, for now. I’ll keep the list updated. If you think I should include any other interesting rich snippets or SERP features or if you can share any useful insights about your experience with rich snippets I’ll be happy. Let me know in the comments below!